A well-written dispute resolution clause is the foundation of an effective dispute resolution process. Parties can insert the standard ICDR arbitration or mediation clause in their contract and can customize their clause further with options that control time and cost, such as the number of arbitrators. 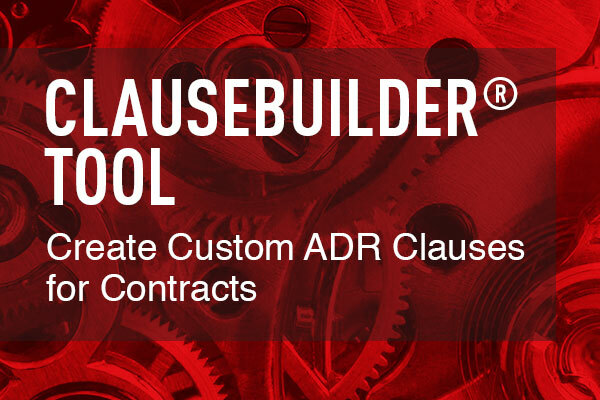 The AAA-ICDR developed the ClauseBuilder® online tool —a simple, self-guided process—to assist individuals and organizations in developing clear and effective arbitration and mediation agreements. Parties can copy and paste this clause into their contacts. Any controversy or claim arising out of or relating to this contract, or the breach thereof, shall be determined by arbitration administered by the International Centre for Dispute Resolution in accordance with its International Arbitration Rules. Some parties prefer not to obligate themselves to mediate as a condition precedent to the filing of arbitration. This clause provides that the parties mediate their dispute but allows them the flexibility of choosing when they wish to schedule their mediation conference. After the arbitration is filed, the ICDR will contact the parties to discuss the appointment of a mediator and their scheduling preferences for the mediation conference. Any controversy or claim arising out of or related to this contract, or a breach thereof, shall be resolved by arbitration administered by the International Centre for Dispute Resolution in accordance with its International Arbitration Rules. Once the demand for arbitration is initiated, the parties agree to attempt to settle any controversy or claim arising out of or relating to this contract or a breach thereof by mediation administered by the International Centre for Dispute Resolution under its International Mediation Rules. Mediation will proceed concurrently with arbitration and shall not be a condition precedent to any stage of the arbitration process. Use of the mediation process is growing globally. In mediation, parties are free to negotiate business solutions not constrained by law or contract. The mediator acts as a neutral facilitator to such negotiations. Parties to ICDR-AAA administered mediations historically have enjoyed a high percentage of settlement. In the event of any controversy or claim arising out of or relating to this contract, or the breach thereof, the parties hereto agree first to try and settle the dispute by mediation, administered by the International Centre for Dispute Resolution under its Mediation Rules. If settlement is not reached within 60 days after service of a written demand for mediation, any unresolved controversy or claim arising out of or relating to this contract shall be settled by arbitration in accordance with the International Arbitration Rules of the International Centre for Dispute Resolution. Parties can of course adopt mediation as a stand-alone dispute settlement procedure. In the event that mediation does not result in settlement, the parties can agree to utilize other dispute resolution procedures or default to national courts for the resolution of their dispute. In the event of any controversy or claim arising out of or relating to this contract, or a breach thereof, the parties hereto agree first to try and settle the dispute by mediation, administered by the International Centre for Dispute Resolution under its Mediation Rules, before resorting to arbitration, litigation or some other dispute resolution procedure.